Welcome to the Family is a series of three letters that will run this week from the heads of Microsoft, Sony and Nintendo. We asked each of the companies to write up a welcome letter to new owners of their consoles. They did the rest. We are running them in the order they were received. Check out Microsoft's and Sony's letters. And now a word from Cammie Dunaway, executive vice president of sales and marketing, Nintendo. 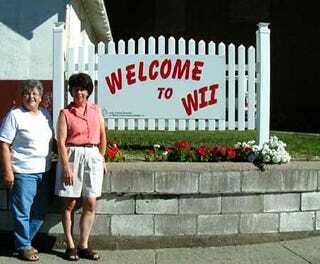 Welcome to Wii! I know it's a little late and unnecessary to address this letter to the many Kotaku readers who bought their Wii when it first hit the videogame scene back in 2006. But to the more than four million consumers who only just discovered this new way of gaming during the November and December holiday period, congratulations on your purchase. In total, ten million other Americans bought a Wii in 2008, and you owners range from the most dedicated, passionate of players, all the way to first time gamers. If you're in that latter group, you shouldn't feel alone. Millions of Americans had no other video game system in their homes when they unpacked their Wiis. In fact, one of those new Wii families is probably about to set up their system in their new home, The White House! On the startup screen, I'm guessing you've already clicked onto the Mii channel and created an in-game version of yourself. Maybe you've even tried viewing your digital photos by plugging your SD memory card and flipping through the pictures with the Photo Channel. Just like the Wii itself, all the functions are set up to be simple to use. But you won't really understand the full range of Wii until you're connected to the Internet. Just click on the lower left of the home screen and it will walk you through the setup. If you have any problems, the quickest help is available at support.nintendo.com. Once you're online, there's a lot more to enjoy. Let me mention just two of your new channel options. The Wii Shop channel on one hand allows you to step back in time. Maybe you fondly remember a game you used to play 20 years ago (could it be that you actually played the original Donkey Kong?) Maybe you wish games could still be like that today. Well, they are-exactly the same. The Virtual Console feature on the channel lets you choose from more than 250 classics, originally released on Nintendo, Sega, and other vintage consoles. What's old really can be new again. Or, maybe you're looking for innovative alternatives to the big name new game releases that grab all the headlines. Then the place for you is WiiWare, where we've invited small, independent development teams to show their work directly to players. A prime example is World of Goo, whose developers created a place where various forms of goo balls combine to build bridges, towers, and interact with the World of Goo Corporation. It's so inventive and so engrossing that it was just named the Best Independent Game of the Year. But that's just one game-there are already over 60 other WiiWare games available. In both cases, you purchase these games by downloading them right to your system, and each game becomes a new channel button on your startup menu. They're easy to find, and easy to buy. To make purchases, use the currency we call Wii Points, available either online using a credit card, or in physical card form at thousands of retail locations. The second channel is the Nintendo Channel. It's an interactive guide to all things Nintendo. You can find information on new and upcoming games, watch video trailers, rate the games you're playing and share your thoughts with other users, and if you someday buy a portable Nintendo DS, you can even use the Nintendo Channel to download demos of DS games. (On the channel, I really recommend the video featuring Reverend Run from Run DMC playing Wii Music). But of course, the great thing about your Internet connection is that you can find dozens of independent game sites with more info and videos, each targeting particular groups of gamers according to their skill level and game taste. So, I could talk a lot more about the channels, but I think it'll be more fun to do some of the exploring yourself. Instead, I'd like to close by discussing some of the key thinking that went into the invention of the Wii. Our global president, Mr. Iwata, has said that the video game industry over the years had inadvertently created a huge wall, distinctly separating gamers from non-gamers. I'm sure many of you have seen someone playing in a store or at a friend's and said, ‘whoa-that's way too hard for me!' That kind of reaction really isn't in the best interest of anyone. For us, the stepping stone is what we call a ‘bridge' game, something that will easily move you new players closer to the full world of gaming. I'll give you one example, Mario Kart Wii. It comes bundled with a Wii Steering Wheel, because even though that wheel isn't required to play the game, we thought it would be the most comfortable way for new players to start racing. Next, instead of just classic Nintendo characters, we let you put your own Mii into the game. Again, the idea is to make it feel friendly. And on the far end of exploration, we even wanted the experience to be so simple and involving that you'd eventually try to jump into online competition, racing against people around the world. So this bridge really leads in two directions: not just from simple-to-more-involving, but also acting like a link between new gamers and veteran ones. If you're interested in more of the thinking behind this, you can find Mr. Iwata and the key developers talking about it at Nintendo.com. Finally, I know many of you may have had a hard time finding your Wii and I thank you for your patience and diligence. Once you have experienced the joy of Wii we know you'll agree that it was worth the wait.